I've been to one Red Sox game so far, it was probably two years ago. My boss had a pair of tickets (really awesome seats) and couldn't go, so she gave them to me. So, at least I'm able to say that I've been to a Sox game. What I haven't had, though, is a field-level tour of Fenway Park. That could be pretty fun. Throughout the current home stand (beginning Friday, August 21st against the New York Yankees), House of Blues Boston will offer a post-game field level tour of Fenway Park. This tour will depart from the House of Blues Restaurant immediately following the game each night and will take fans onto the field at Fenway Park. The tour will include a behind the scenes look into the historic scoreboard inside the Green Monster. Everyone on the tour will receive a complimentary Red Sox cap and souvenir Fenway field dirt. Tickets for the post-game tour will only be available in House of Blues retail store to patrons. Tickets will be $40 each and are limited to 20 tickets per night. Tour tickets will only be available on the day of the game; no tour tickets will be sold before the day of the tour. It sounds like a pretty fun thing to do, especially if you've got friends visiting from out of town. There's two things my friend Ann wants to do whenever she visits Boston. Go on a duck tour, and go to a Red Sox game. I have yet to do either with her. But one of these days, perhaps I will. 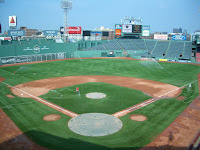 0 Response to "HOB Tours of Fenway Park"